You know me-I'm an anti-clutter fanatic. I wrote the book on the subject (It's Here…Somewhere). So when I recommend a product or tool to include in your kitchen inventory, you can count on it truly being worth the space it will take up. That said, the tool I am recommending is the Salad Genie. Ever heard of it? I hadn't, until I read about it on one of my favorite cooking products sites, The Prepared Pantry (www.preparedpantry.com). It retails for $9.49, but I found it on amazon.com for between $8.03 and $3.70. It's about 8 inches high and is made of glass. 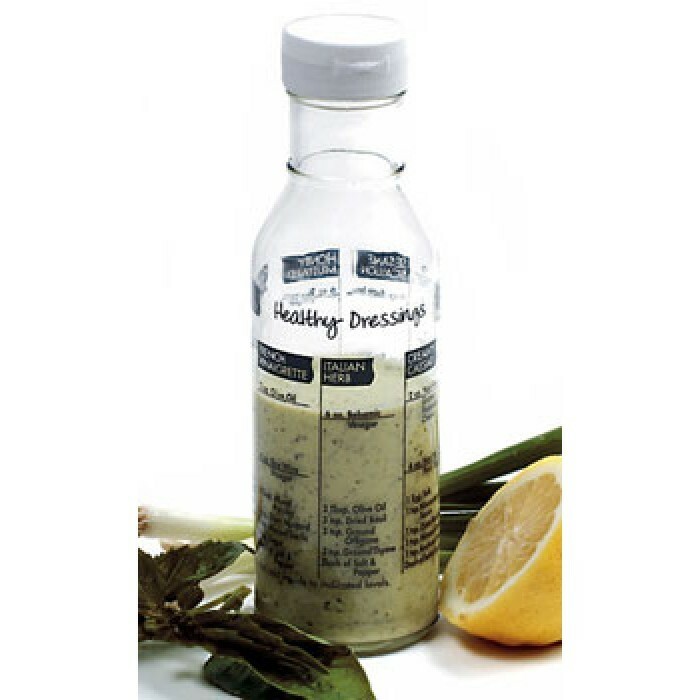 And as the photo shows, the bottle is covered in tested and approved low-fat salad dressing recipes (French Vinaigrette, Italian Herb, Creamy Caesar, Sesame Scallion, Honey Mustard and Creamy Citrus Ginger). Don't you think that idea is brilliant? 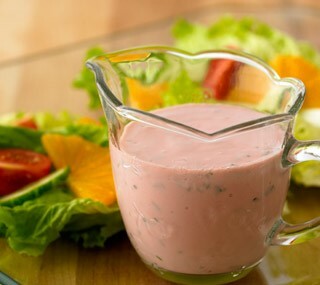 "Good salad dressing maker and server. Pours well with no dripping. Neck is wide enough to fill without spilling ingredients. While I haven't tried all the recipes listed on the bottle, the ones I have were tasty." "I've had this little salad dressing bottle for a couple of years, and use it often. The recipes all "work," but my favorite is honey mustard. My favorite "trick" is to start with one of the recipes on the bottle, and then change it up a bit, adding lime juice or ginger or some other flavoring to make it totally my own unique mixture. Having the recipes on the bottle means I never have to dig around to find one to use as a starting point. I'm single, and it doesn't make a huge amount, but should be enough for at least 6 servings. The leftovers store just fine in the bottle. Seriously, I can't find anything wrong with this. It just works!" "I love this bottle and the recipes are delicious. The one drawback, which I learned the hard way: it can't go in the dishwasher as the printing comes off. Thank goodness I'd printed the recipes on cards before I put it in the dishwasher!" So if the only drawback is that it can't be put in the dishwasher, that's pretty good. I'm OK with washing it by hand, considering how helpful this item is. We all know homemade dressings are much healthier for us, even if it's just because of the absence of chemicals, preservatives, and other mystery ingredients. But what I like is the idea that I can mix up my favorite dressing and pack it with me-on road trips, to work, or even to a restaurant. Now if this kitchen tool interests you, too, here's something else that might interest you. The Prepared Pantry (www.preparedpantry.com) is giving this bottle away with just a $10 purchase off their site. They sell baking aids, and other quality ingredients and food products, mixes, tools, the list goes on. I have no affiliation with Prepared Pantry, other than being a regular customer, and I gain nothing from recommending you go there and consider shopping with them. I'm just reporting some good news! But however you go about looking into this handy tool, do look into it. It's not often I recommend collecting another kitchen tool-we're living in a space-poor, thing-rich world, after all. But this is one that really earns its keep. It's a tool we don't want to live without!